Moments ago, the U.S. State Department issued a presidential permit for the construction of the controversial Keystone XL pipeline, seven years after it was initially commissioned. Before the struggle over the Dakota Access pipeline came to the forefront of national news, there was the Keystone XL pipeline. Commissioned in 2010 by the TransCanada corporation, the seven-year-long debate over the pipeline’s future has been symbolic of the fight over the future of the United States’ energy policy in the face of diminishing fossil fuel supplies and climate change. While former President Barack Obama won the approval of environmentalists in 2015 for his rejection of the pipeline, his successor Donald Trump has now put an end to the debate by officially issuing the necessary permits for the project’s completion. Moments ago, the U.S. State Department issued a presidential permit for the Keystone XL pipeline. 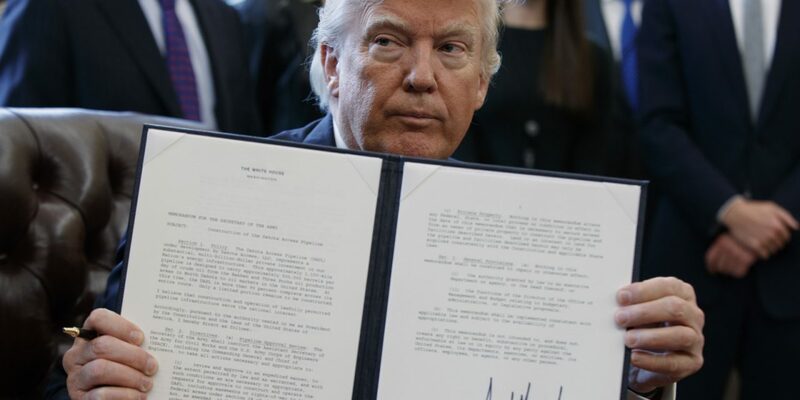 Trump’s approval of the pipeline should come as no surprise as he made his position on Keystone XL quite clear months ago when he signed an executive order advancing the pipeline’s approval. One of the ways in which he advanced the pipeline was by shortening the environmental review process, a move which drew consternation from environmental activists and concerned citizens who oppose the pipeline. Trump, as well as the fossil fuel industry, have argued that the pipeline is essential to securing the nation’s energy independence as it will reduce the country’s dependence on foreign oil. However, Obama – when he rejected the pipeline – argued that this was not the case and that the pipeline would also do little to reduce domestic energy costs. Environmentalists have consistently slammed Trump’s stance on the Keystone XL pipeline. Tom Steyer of NextGen Climate, told CNN that Trump has put “corporate interests ahead of American interests” by supporting and advancing the pipeline, adding that “The pipelines are all risk and no reward, allowing corporate polluters to transport oil through our country to be sold on the global market, while putting our air and water at serious risk.” Now that the pipeline has been officially confirmed, environmentalists are likely to voice their concerns even louder as Trump makes good on his promise to keep the United States on its long-standing and arguably misguided energy policy of fossil fuel dependency. Read TransCanada’s news release here. This article first appeared on MintPressNews.com and was authored by Whitney Webb.